Focusing a Spotlight is like concentrating the Sun’s Beam with a Magnifying Glass, like you did when you were a kid burning your name into a piece of wood. 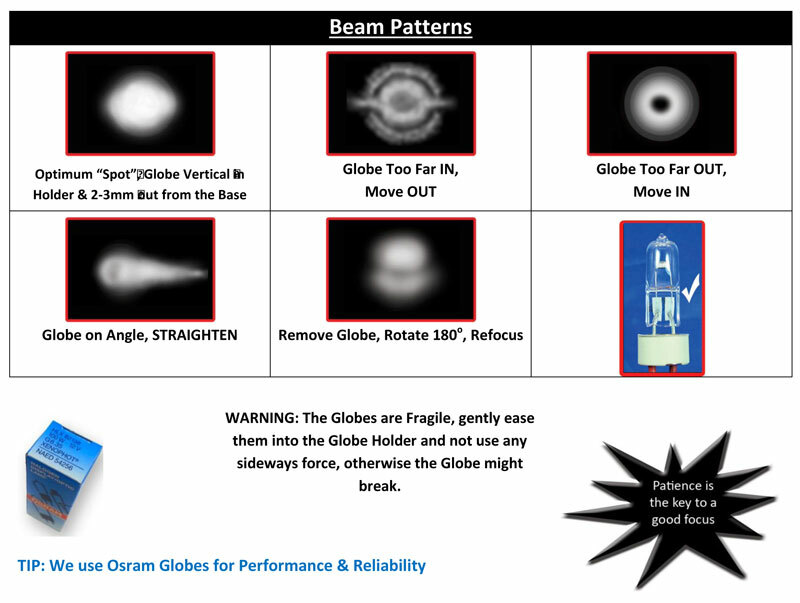 By moving the Globe in or out of the Globe Holder, you can broaden/tighten the Beam to the desired output. All of our Powa Beam HID and Quartz Halogen models are Hand Focused before they leave the Factory, so the only time you would need to focus a Globe would be during replacement of a blown Globe. The best way to focus a Bulb is to shine the Spotlight on a wall about 10m away and look at the pattern of light that it is showing. The images below show different patterns that can occur, and how to fix them to get the optimum Spot. Make sure to keep your fingers off the Globe by using a cloth or cardboard when moving it, if you accidently touch it during focusing then use Metho to clean it. Also be careful as the globe can get very hot.